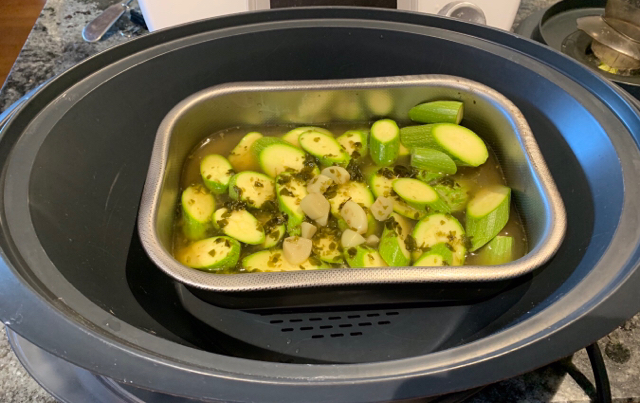 Forum Thermomix - The best community for Thermomix Recipes - Warm Salad of Steamed Courgettes (Zuchinni) ,with Garlic and Oregano. Warm Salad of Steamed Courgettes (Zuchinni) ,with Garlic and Oregano. This lovely light vegetable dish is adapted to TMX from an Ottolenghi recipe in his new book, Simple. It is particually suited to the light coloured skinned Zuchinni. The skin on these Zuchinni is more tender than the dark skinned ones. If however you only have the dark green Zuchinni, I suggest that you remove 1/2 the skin. The stock is prepared in the TMX bowl and then used as the poaching liquid for the Zuchinni, in a dish in the Varoma. 1 cup of stock, vegetable or Chicken. 1 Tablespoon of dried Italian or Greek Oregano, or 10 sprigs of fresh Oregano. Place stock, garlic and Oregano into TMX bowl, cook 10 minutes, speed 1, Varoma temperature. Slice Zuchinni into a dish that will fit into Varoma. Cover with the hot stock. Pour 1 litre of water into TMX bowl and place Varoma steamer on top. Place a Crumpet ring or a couple of wooden skewers in Steamer so steam can circulate. Place dish with Zuchinni into Steamer and cover with foil or lid. Steam for 30 minutes, Varoma temperature, speed 3. To serve, lift the Zuchinni out of the liquid. Sprinkle with a little Olive oil. Optional. Re: Warm Salad of Steamed Courgettes (Zuchinni) ,with Garlic and Oregano. Great method Chookie, is it really tasty? Yes very. I grew the ones in photo. This recipe really lifts the flavour. Method sound complicated , but isn’t. Lovely looking zucchini and a great sounding recipe. I often have a zucchini or two left in the fridge so I will definitely try this. I may even get some baby ones so that they are tender. I even have fresh oregano, although I am going to pull it up as it just goes mad. Great looking recipe. Your courgettes look so fresh Chookie. Great recipe Chookie . 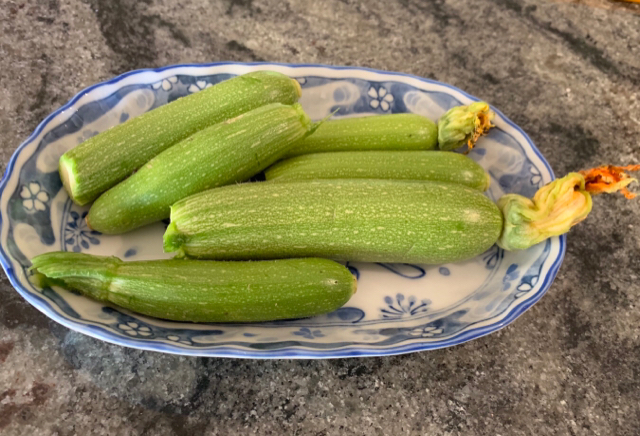 Love pale green zucchini. Must give this a try soon .